If you've come to Churchill to experience the legendary Polar Bear tours, the Beluga Whales or the Hudson Bay's historical sites, know too that Churchill is among the best places in the world to take an adventure via dog sled. In fact, there's positively no better way to catch the Spirit of the North than by taking a dog sled adventure. Visitors that come to Churchill to view polar bears and whales often comment that their dog sledding adventure was among the unexpected highlights of their trip. Whether you're looking half-day, full-day, or multi-adventure tours - there's a dog sled adventure for just about everybody. Dog power has been utilized for hunting and travel for hundreds of years. As far back as the tenth century these dogs have contributed to the Northern culture. Several distinct dog breeds are used as sled dogs, although any medium-sized breed may be used to pull a sled. Purebred sled dog breeds range from the well-known Siberian Husky and Alaskan Malamute to rarer breeds such as the Mackenzie River Husky or the Canadian Eskimo Dog. Dog sled teams are put together with great care. 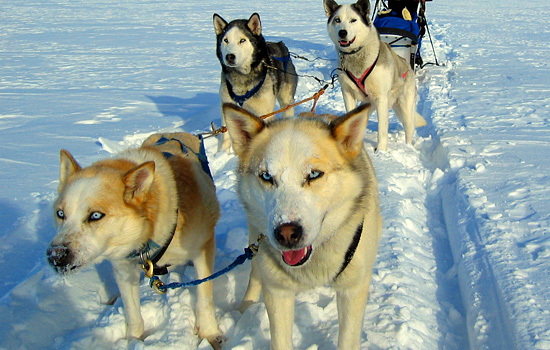 Generally, a dog sled team involves putting together a team of leader dogs, point dogs, swing dogs, and wheel dogs. Throughout the history of Churchill, dog sledding has remained an important piece of the city's culture and heritage. In fact, a few northern mushers in the Churchill area still use sled dogs as their primary form of transportation in the winter months. There are no better ambassadors to the Churchill area than the famous sled dogs of Churchill, Manitoba! Today, the carefully groomed trails around the Churchill area make dog sledding an exhilarating experience you'll never forget. Learn about the rich history of the Inuit and other native tribes who first embraced the majestic northern-dog-sledding breeds. After you acquaint yourself with the history, meet the dogs and saddle up in the sleigh. The highly trained dog sled teams will take you on a winter wonderland sleigh ride through the pristine boreal forests of the Hudson Bay area. After sledding through the array of scenic vistas and panoramas—take a pit stop at a number of lodges to grab a cup of hot cocoa. Whatever type of Canadian sled dog tour you decide to take in Churchill, it'll undoubtedly be the adventure of a lifetime. Just make sure to snap a photo with the dogs before you leave. Need more information on Dog Sled Adventures In Churchill? Talk to one of our Canadian travel Insiders who'd be happy to answer all your questions.